In response to the volume of interest shown in the initial printing of Liber Falxifer and due to the fact that not every book reached their intended hands, a second edition will now be made available for those who seek the wisdom and guidance offered by the T.F.C. This second edition will contain some crucial additions and rectifications concerning certain important sections of the book. The Second Edition of Liber Falxifer The Book of the Left-Handed Reaper, is also intended to prepare the pathway for the next written emanation of the Necrosophic Current 182, which at Walpurgis Night 2011 shall take shape and manifest in the form of a sequel: Liber Falxifer II - The Book of Anamlaqayin. Liber Falxifer is the long awaited book that reveals the secret teachings of the Necrosophic Cult within the Current 218. This book of the Scythe-Bearer provides a solid theoretical, historical and mythical foundation for the Cult of the Left-Handed Reaper, and offers clear instruction for ritual practice connected to both the folk-magical tradition, as well as the more sinister, hidden line of traditional witchcraft connected to the Cult of the Skeletal Lord of the Bloody Scythe. The basis for the various forms of magic presented in Liber Falxifer is a dark form of telestic fetishism steeped in the forbidden and concealed traditions of both necromantia and necromageia, as practiced within the many clandestine magical paths connected to the Lord of All Graves. The grimoire is broken out into two parts, the first of which is a discussion of the relevant aspects of the exoteric Latin American Cult of the Lord of Death. Topics offer insight into the origins of the Cult and the different forms of the open and closed Cults of the Master, the various altar setups and their significance, the specific traditional offerings given to the Lord of Death, the empowered talismans and fetishes used within magical practice, the different methods of consecration, traditional spells and rituals for magical protection, revitalization and malediction, and a curse to bring death to one's foes. The second part of Liber Falxifer focuses entirely on the more esoteric aspects of the Hidden Cult of Death, first noting that its essence is partially expressed through some of the same symbolism used within the folk-magical practice, but then taking matters much deeper into the darkness of the mysteries of the Sinistral Death, presenting not only an esoteric crossing between the two cults, but a complete system of practical Necrosophic Sorcery. Amongst the topics discussed are the pagan roots of the Master of Death, His true identity as it is understood within the Templum Falcis Cruentis, His many names of power and various aspects and manifestations, the Formula of Calling and Invocation to the Lord of the Scythe, the esoteric ritual for the ensouling of the altar statues of the Left-Handed Harvester, the workings with the altars used within the esoteric line of practice, the many different talismanic symbols, sorcerous insignia and the Key Sigils of Death, the buying of soil from the dead, the mysteries of Death's fell garden, the creation of fetish-skulls and the many different ways that they can be employed within the Necrosophic practice, the magic of tobacco and the secret tincture of its great daemonic shade, the Rosaries of Death and their construction, the Altar of the Dead and the veneration of the shades of the True and Secret Ancestry, the Sigil of Resurrection and instructions for the creation of a Spirit Box used to house the shadow of the dead, the Sceptre of the Shadow of Death and its creation and consecration, and much more. 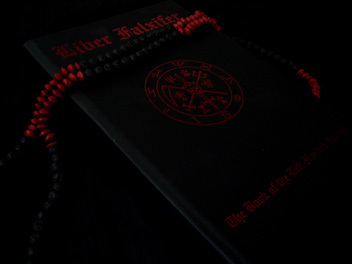 Written by the Magister of the Temple of the Black Light and the Templum Falcis Cruentis, and illustrated with selected original artworks depicting the esoteric manifestations of the Lord of Death, Liber Falxifer presents a unique and powerful system of both low and high Black Magic based on a valid synthesis of folk-magical sorcery, antinomian Gnosticism, the telestic arts of ensoulment and fetishism, kliffotic Kabbala, and anti-cosmic Luciferianism.